But self-destruction doesn’t only come in the form of substance abuse. Some of the most self-defeating acts we engage in involve falling into negative thought patterns that prevent us from moving forward and living life to the fullest. We get caught in a space of anger and resentment that drives us away from tranquility, and can even threaten our sobriety. That’s where Dr. Nicholas Ney comes in. Nicholas is a clinical psychologist and forgiveness educator who facilitates forgiveness workshops at Alta Mira. With nearly three decades of experience working with people struggling with addiction, he understands the unique role of forgiveness in the recovery process and seeks to be a catalyst for positive change in the lives of our clients. In this interview, he shares his perspective on what forgiveness looks like and why it is a central component of recovery. Forgiveness is not an obscure clinical concept; most take for granted that we know what forgiveness entails. But when confronted with the actual task of forgiveness, many of us find that we are not exactly sure what forgiving looks like, which makes it hard to actually do. Forgiveness is not reconciliation. You don’t have to rejoin a relationship. It doesn’t mean that you condone what somebody did, because forgiveness doesn’t mean you think they did something right, it just means you don’t have to have a hostile reaction to it. Ultimately, forgiveness is an internal shift in your own perspective, and a decision to reframe your own reaction to undesirable outcomes. Deciding to let go of hostility and move forward without bitterness can have great benefits for anyone, whether they are struggling with addiction or not; holding on to anger and resentment overwhelmingly does not enhance quality of life, but diminishes it, and keeps us from living with joy. But for people in early recovery, forgiveness takes on special importance. Early recovery can be a time of immense ups and downs on all fronts. Given how pre-recovery is dominated by denial and victimhood, early recovery is a time to bolster yourself with tools such as forgiveness training, so that one’s inner transition from the vagueness of pre-recovery to emerging clarity can occur on sound ground. Forgiveness training can provide individuals with skills that can help them learn how to not take internal and external offenses personally, as well as how to take responsibility for their own emotional experience. Those internal offenses can be particularly troubling in early recovery; without the protection of denial, you are left to confront the reality of your addiction, and you may not like what you find. Having to deal with that pain at precisely the moment you have left your primary coping mechanisms behind can be overwhelming and put you at risk for relapse. Forgiveness training gives you a path to both acknowledging and coping with the difficult emotions you experience, especially as they relate to your view of yourself. Denial doesn’t give up easily or quickly for some of us. Letting in the range and scope of one’s wreckage from the past can induce a lot of shame and guilt. And if that happens, the likelihood for getting overwhelmed and retreating into old self-destructive behaviors increases. Early recovery, I’ve found, can be an ideal time to learn how to identify when one’s emotions are running hot and raw, along with identifying some useful forgiveness strategies that promote healthy grounding. 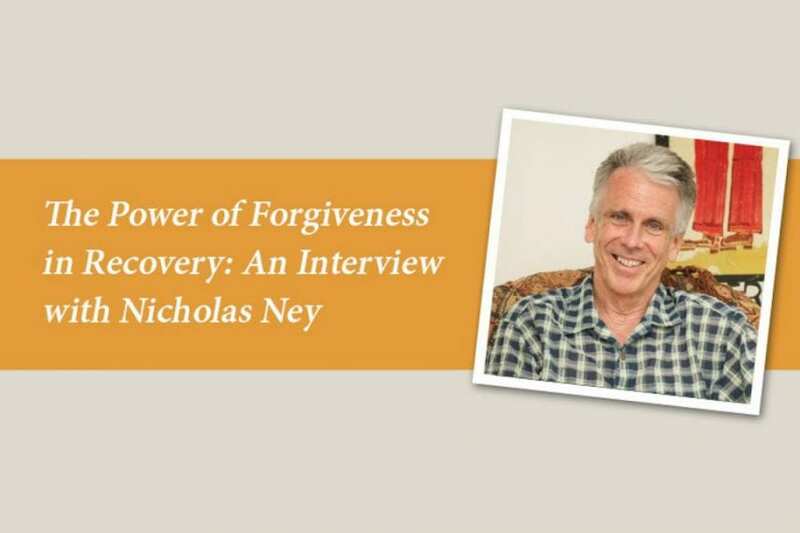 Learning how to forgive yourself, then, is a core component of Nicholas’s work. But learning how to forgive others as you emerge from denial is an equally important piece of the puzzle, as early recovery can be a time of explosive emotion and maladaptive coping that interfere with your ability to accept concern, love, and caring. One of the core elements of forgiveness is to not take things so personally. That’s really hard to do when one’s nervous system is hot-wired to do just that. Because when any of us are in denial, we’re inclined to believe—and I can certainly say this for myself—that if someone is showing me concern or trying to be understanding, I’m going to read that as an attack. And once I get in an attack mode, my nervous system is going to jump in. Once all of the adrenaline and cortisol take over, I can say without equivocation that what comes out of my mouth is loud, stupid, and regrettable. And all that adds up to a disaster in terms of trying to make sense of how I want to cope in the world. Nicholas believes that in developing the ability to forgive, we also learn to take control over our emotional landscape, giving us the ability to see others more clearly and respond rationally to the true intentions of our loved ones. Forgiveness as a Stress Management System: Forgiveness is not simply an arbitrary good, but functions as a concrete way of emotional regulation and coping with stress. “When one’s nervous system is quick-wired, reactive, and always heating up, our capacity to process things in a healthy way is pretty limited,” Nicholas explains. “If anything, it can just force us to create more problems.” These problems manifest not only in our emotional experiences and interpersonal relationships, but in our physical health. By developing the skills to forgive, we can protect and enhance our psychological, social, and somatic well-being. Identifying Grievance Stories: “A grievance story typically isn’t a run-of-the-mill little thing that we get hit up with on a daily basis, but is some experience that burrows underneath our skin and festers,” Nicholas says. “We become victims, and we repeat the story over and over again.” Often, grievance stories are not grounded in reality, and our pain is not commensurate with the experience itself. “It has more to do with a fiction that we have created—some artifact we carry around—for months, years, decades, that that’s what’s paining us in real time. It’s not the pain we felt initially from the experience, it’s the pain we keep alive and memorialize in our minds.” By identifying these grievance stories, we can change the narrative about who we are in the world, who we are in our relationships with others, and how we feel about ourselves. It is hard to overestimate the impact forgiveness can have on your life and on your healing process; after all, there is a reason forgiveness is such a hot topic within the recovery community. What makes Nicholas’s workshop so powerful is that it gives people a language for talking about forgiveness in a supportive environment and a roadmap toward achieving it. Rather than being a vague concept, forgiveness becomes a concrete process and attainable skill with clearly defined benefits. For many, this approach is transformative, and allows them to see themselves and the world around them in a new light. I recall one person in my group one day, a young man in his early 30s, who had been at Alta Mira for a while and hadn’t really opened up about the challenges he had with his mother—and whatever was right in the air that day for him I’ll never know, but he found it possible to talk about things that he hadn’t previously. He came up to me after group and said, ‘Thank you, this system really makes sense, and I can see how it could work for me in good ways.’ I was thrilled. Alta Mira offers a comprehensive suite of programs for people struggling with substance addiction as well as co-occurring mental health disorders and process addictions. To learn more about our unique approach to addiction treatment and our innovative workshops, we encourage you to contact us at any time.